The Kentucky Derby and Cinco de Mayo always are on the same weekend which is tough for someone who loves both of them; especially when it comes to my decision for what to make for Friday Cocktails. In years past I’ve always honored the horse race with a new version of a mint julep or a cocktail associated with another race in the Triple Crown assuming plenty of other people make great dishes and cocktails for the Mexican festival. Not this year. First of all the race is tomorrow and the weather forecast is gloomy in Kentucky. I can’t watch horses race in bad weather; I worry too much about them getting injured so I plan to spend my day gardening instead. As a result l decided that this year it’s high time I honored a festival that is actually a big deal in Denver and share one of my favorite margaritas. One that is so easy that I’m sort of embarrassed that I’ve never included it here before. 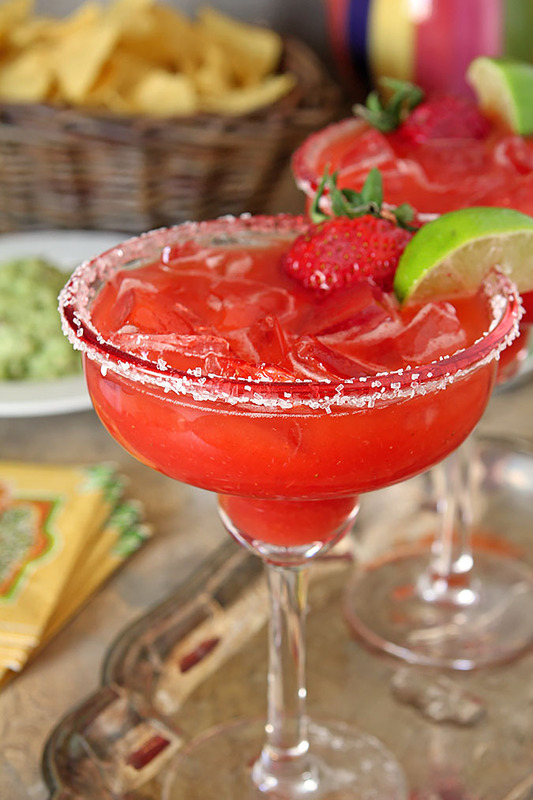 Oops…time to rectify that with these Fresh Strawberry Margaritas! 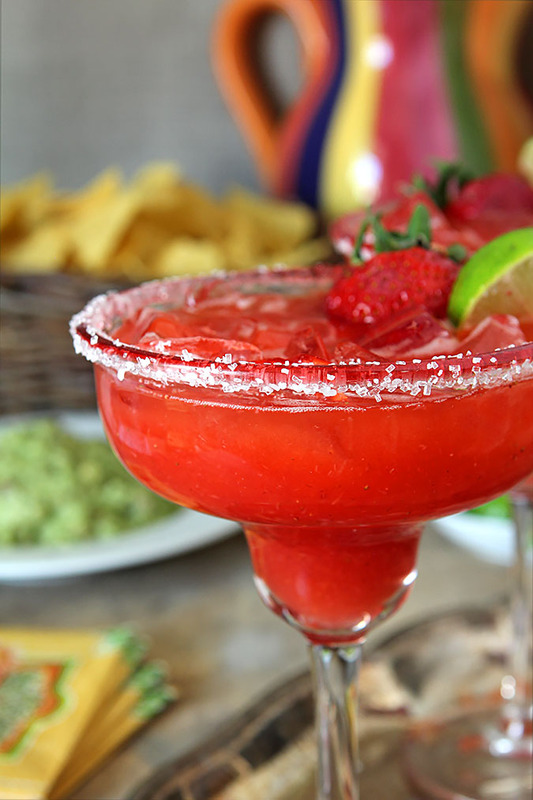 When I first tried a margarita it was a Frozen Strawberry Margarita served in the quintessential margarita glass. I’m betting it was from frozen strawberries and mediocre tequila so I was soon trying my hand at making them fresh at home. The difference? Beyond compare. I’ve always espoused using a good brand of tequila, real orange liqueur and fresh fruits and I’m not stopping now. Using some fresh spring ripened strawberry makes all the difference, in both color and taste. Last, but not least for me? I never make a frozen margarita; I so prefer them poured over ice. That’s purely personal preference though…if you want yours frozen simply add a couple of cups of ice to the blender when you make these and frozen yours will be! It took all I had to not have one of these babies sitting here with me at my desk while I hash out this (late) post, but I’m holding off…friends are showing up later and it’s worth waiting for. And I’ve tested those waters before. While I do love a great cocktail I’m not immune to the giggly results of one and I always worry I’ll say something totally off the wall if I start typing while I’m sipping. I’ll save the giggles for later when a girlfriend is here; cocktails are more fun with company anyhow, don’t you agree? 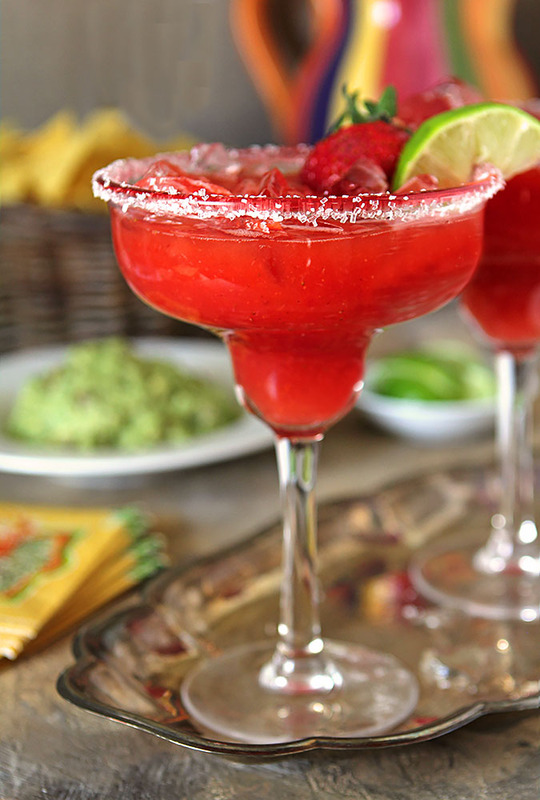 Try some of these Fresh Strawberry Margaritas and you’ll see! Want some more ideas for a Mexican fiesta? I’ve got a whole lotta margaritas! 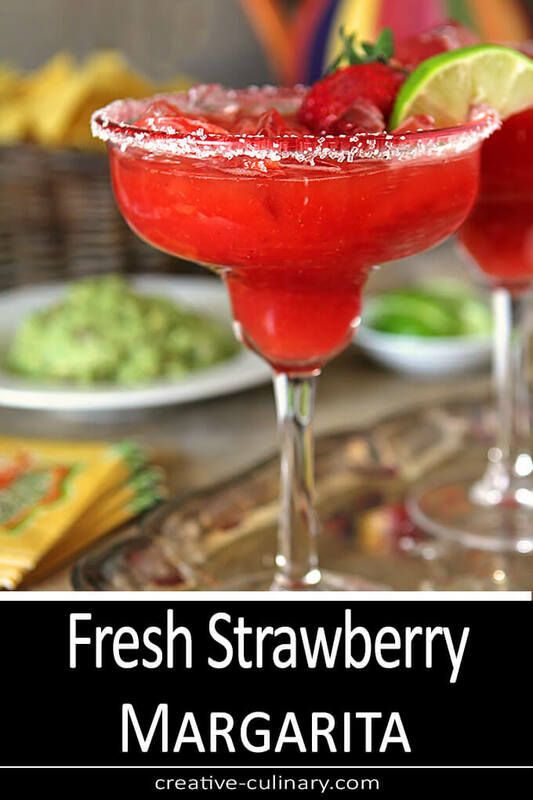 Combine strawberries, tequila, lime juice, lemon juice, simple syrup, honey, and orange liqueur in a blender. Pulse until completely smooth. Let the mixture sit for a couple of minutes and skim off the bubbles at the top with a spoon. Taste and correct with tequila or sweetener if needed. Rub a lime wedge around the rim of the glasses and then dip the rim in a combination of kosher salt and sugar (I love cake decorating sugars). Fill the glasses with ice and pour the strawberry mixture over the ice. If you want to serve them frozen, just add approximately 3 cups of ice to your blender and pulse to desire consistency. Garnish with strawberries and lime wedges. I’ve never actually made a frozen strawberry margarita. Guess I need to one of these days, huh? 🙂 This looks excellent for both Cinco de Mayo and the Derby. Or any other day of the year. 🙂 Thanks! I could drink WAY too many of these – it’s like candy. 🙂 The photographs are stunning too.